Whether you are looking for a casual job, and entry level post or whether you are at a higher level in your career in the aviation industry and are looking for your next move, Airport Jobs in Gulf Countries could be a great choice for you. There are many international airports within the Gulf region serving the needs of the Middle East and connecting this popular region with the rest of the world. Gulf Countries are becoming more popular than ever with tourists, with Saudi Arabia, Bahrain, Oman, Kuwait and Dubai attracting more visitors than ever before to explore the attractions that the Gulf has to offer. The international airports such as the Dubai International Airport, Hamad International Airport, King Abdulaziz International Airport and Abu Dhabi International Airport are just some of the biggest and best known sources of aviation jobs in this region. If you are looking for airport jobs in Gulf Countries, keep reading to find out more. There are part time, full time, permanent, temporary and contract posts available to suit the needs of all kinds of applicants. 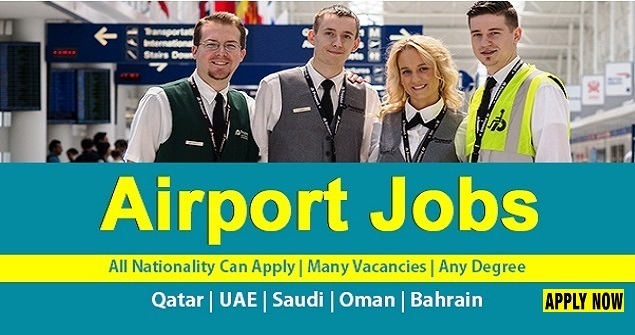 There are several different places you can begin your search for airport jobs in Gulf countries. First of all, if you know which airport you would prefer to work in, you can visit the website for that particular airport and find their careers page where you will find all of the relevant listings for vacancies at that site. If you are unsure of which airport you would like to work in, one of the general job listing websites for the Gulf region, such as NaukriGulf, Indeed, GulfTalent or WeJobz will give a greater overview of all of the different opportunities within the entire region to suit your needs. The type of experience and skills necessary to apply for airport jobs in Gulf countries will depend on the position being applied for. It goes without saying that jobs as an aircraft pilot, for example, require specific training and experience, however there are many posts which are open to those with no prior experience and only high school education. Housekeeping roles and food and beverage service are just some of the entry level posts which are open to those who are just starting out on their career path.Good communication skills are important, with language skills being a bonus, especially in roles which have contact with the public, and good customer service skills are also often a must. Computer literacy is also important for many posts while good personal presentation is also important in many cases. For some jobs, there are specific requirements with regard to appearance or background. A clean criminal record is required, and for roles such as cabin crew there are also certain height and appearance requirements such as no visible tattoos or non-removable piercings.